Brian S. Wesbury '89, named the "best economic forecaster" by The Wall Street Journal for 2001, presented his insights on the U.S. economy to students, alumni and prospective students at the Kellogg School's Alumni Speaker Series. The speech, held Feb. 4, launched the new speaker series sponsored by the Kellogg part-time MBA program, The Managers' Program. 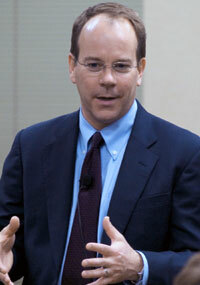 Wesbury addressed tensions in the United States following the war in Iraq, changes in the technology industry and concerns over an increase in jobs moving offshore. He nevertheless forecasted positive trends for the U.S. economy, predicting that growth will be similar to what was seen in the late 1990s. Wesbury, first vice president and chief economist at the investment banking firm Griffin, Kubik, Stephens & Thompson Inc., said he expects that interest rates will increase around May 2004 and that there will be a 6 percent treasury yield within the next year. Additionally, unemployment rates will fall, he predicted, and inflation will rise to 3 percent in 2004 and 4 percent in 2005. 2004 will also provide 20 to 25 percent growth in profits for companies, he said. "In the end," Wesbury said, "I'm very optimistic about the future." For more than 20 years, Wesbury has been forecasting the economy for the U.S. Congress, investors, bankers and traders. He is regularly featured on CNBC and CNN and in Barron's, Investor's Business Daily and Forbes.